HRANA: Ahmad Karimi, a political prisoner in exile inside the Gonbad Kavous Prison, has developed acute stomach complications and judicial authorities have set bail of nearly $1 million for his release on medical furlough. Arrested on May 24, 2009, Ahmad Karimi, a carpenter, was first sentenced to death on charges of "membership in 'the Kingdom Assembly of Iran' (Anjoman-e Padeshahi Iran)," after he spent 40 days in solitary confinement where he was forced to make fake confessions against himself based on a script handed to him by his interrogators, according to a letter Karimi wrote from prison. 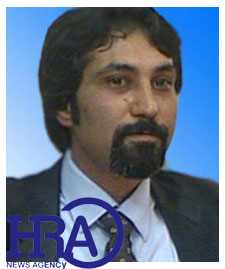 Ahmad Karimi was one of some 100 individuals tried in a post-elections group show trial in August 2009. He was first sentenced to death, and later his sentence was reduced to 15 years and three months in prison in exile. Several other individuals, also arrested before the election, were tried along with Ahmad Karimi under similar circumstances, Ali Zamani and Arash Rahmani, were later executed. Like Karimi, Zamani and Rahmani had been arrested before the election, but were forced to make confessions about their part in planning riots during the post-election events. Gonbad Kavous Prison lacks an equipped infirmary and Karimi has been consistently given painkiller instead of an effective medical treatment. Karimi's family are incapable of posting his bail for his medical furlough. Ahmad Karimi, Hadi Ghaemi,and Jamal Aminzadeh are the only three political prisoners inside the Gonbad Kavous facility and they are kept with hardened criminal. what can one do, while a nation pursues cruel hopes they were deceived into pursuing? So long as the west stays on its path, the future only gets darker by the day. Regime change is the only way out of this 34 year nightmare. Messianic Islamist Rapists, “reformers” and all, are reform-proof and ideologically anti-human rights.